Here we will consider the costs of a vehicle that is only run by electricity compared to a vehicle run by petrol or diesel. All comparisons are made excluding tax. This link shows the cost of new electric production. The average price of electricity from 2006 to 2010 was around 42 EUR/MWh that is around 0.4 SEK/kWh. The price on the spot market 2001 to 2009 went from 0.20 to 0.40 SEK/kWh according this link..
As an average the spot price is around the same as the price of new electric production that is 0.40 SEK/kWh. This price excludes the cost of transmission, distribution and taxes. Let us compare this base price and to what petrol fuel costs excluding taxes. 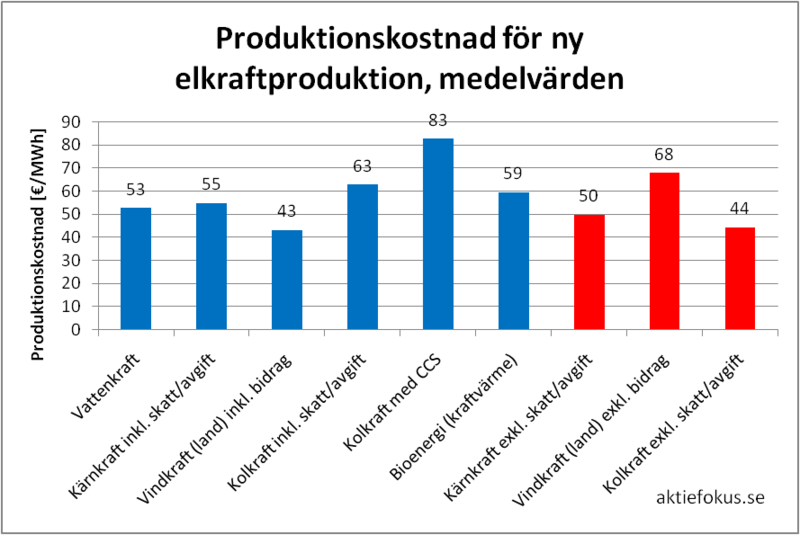 According to this link the cost of petrol 2011 is around 13 SEK of which 6 SEK is cost and profit and 7 SEK is tax. In order to compare the operation costs of petrol cars and electric cars, we need to understand the efficiency ratio of the two vehicles. Fossil fuels have a net energy content of 33 MJ/litre for petrol and 35 MJ/l for diesel according to this link. A petrol motor has an efficiency of around 30% at maximum load. A diesel motor has an efficiency of around 40% whereas, an electric motor has an efficiency of around 90%. However, allowing for reduction in the electric motor efficiency for the drive and loss of power in the batteries, we can estimate the net efficiency to be around 85%. The cost to operate a petrol car excluding tax is 6 SEK * 0.8 = 4.8 SEK per mil. Corresponding car that is run by electricity need 7.9 MJ / 85 % = 9.3 MJ, that is 2.6 kWh. The saving excluding tax is 4.8 – 1.0 = 3.8 SEK per mil. The cost benefit to the user of an electric vehicle at current petrol and electricity prices is significant. The analysis of electric cars is based not only on the cost saving, but also the environmental impact. You can read more about the comparison of electric and petrol car CO2 emissions here.